A tradition of excellence runs deep at Marek and at Texas A&M University. 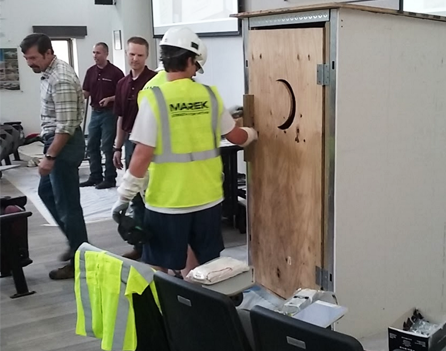 This was on full display this summer when Marek brought real world construction into the classroom for TAMU’s Construction Science 254 Materials and Methods lecture class. In the the TAMU Construction Science Department’s new Francis Hall, the Bob Segner Auditorium was transformed into a real life construction project. Students, under the guidance of Marek, directly participated in the construction process. Students reviewed plans and specifications, laid out the work from established control lines, and installed cold-formed steel framing and drywall, all while keeping the project on schedule. Safety and communication were emphasized throughout the project, and students were able to experience first-hand the importance of many skilled craftsmen performing at a very high level to ensure a safe, smooth, profitable project for all parties involved. "Marek did a phenomenal job in presenting their work to the class. They allowed the students to interact with them and actually build a model they had designed. The planning and effort put into their presentation really makes me feel that they actually cared about getting their audience to understand the topic, and it was very easy to follow along with their direction," said A&M COSC student Danny Rios. From safely stocking materials onto the jobsite to the final mounting of the door, students wore full PPE, used actual tools of the trade, and installed the specified materials. 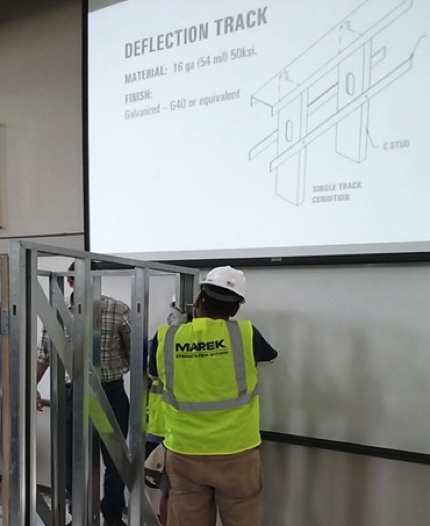 During the construction project, Marek provided information about industry methods, technical properties of materials, and real life scenarios to help prepare students for their careers after graduation. “In my five years of teaching and involving industry in the classroom, Marek’s presentation was far and away the best I’ve ever seen. I asked for some guest speakers, but received instead a thoroughly engaging and entertaining presentation that the entire class enjoyed,” said Department of Construction Science Professor Ben Ashburn. 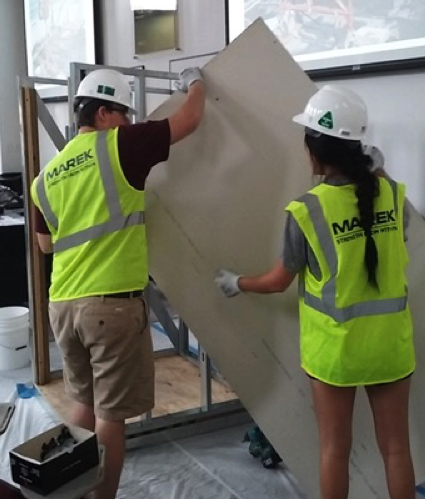 This class served as another example of Marek partnering with Texas A&M to prepare the next generation of construction leaders who will soon shape our entire industry. Marek agrees and has been a proud supporter of Texas A&M’s Construction Industry Advisory Council for over 15 years, contributing scholarships and offering careers and internships to students in the Department of Construction Science.